David Schooley is a mountain man and for decades has had, as the main object of his earthy affection, San Bruno Mountain. He continues to lead the battle to preserve what remains from the developments that I can see have made progress up this small range's slopes since I lived nearby, 45 years ago. San Bruno mountain is just over the southern border of San Francisco. From its major peaks one can see the City of South San Francisco and San Francisco Airport (SFO) immediately to the South, a panorama of the Bay and parts east and, of course, San Francisco. My father, Conrad Pavellas, once was a leader to preserve the mountain from development in the 70s, I believe, which is why David contacted me. He wanted some backgound on dad which I gave him, on tape. He invited me on one of his regular saturday hikes up one of the peaks, directly accessible from the City of Brisbane, tucked into an eastern corner of the mountain, My family lived here before I can remember, but somewhere there is a picture of me and the dog Brownie that we had when living here in 1939. So, David led me and a few other people up some obscure trails and paths, past unique and rare plants and animal habitats that are endangered: A rare manzanita, hummingbird sage, wild begonia, sedum that protect the the elfin butterfly. Some of the flora are found only here and on Twin Peaks in San Francisco--these two sets of peaks are part of an ancient row of islands, and are the only two such "islands" left with these life forms. 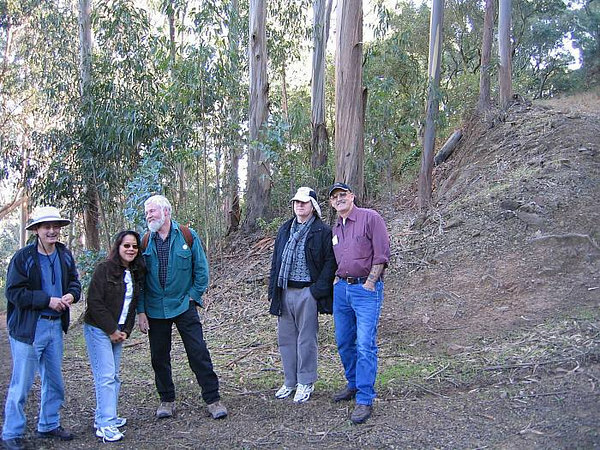 We parked the vehicle just down the slope behind the group and began trudging through the eucalyptus which are essentially weeds in this setting.